Because of the films they’ve made, and because of their work in the #StopSurrogacyNow coalition, our friends at The Center for Bioethics and Culture (CBC) are regularly contacted by women who find themselves in the midst of surrogacies that are in the process of going wrong or who are living with the aftermath of a situation that went wrong. 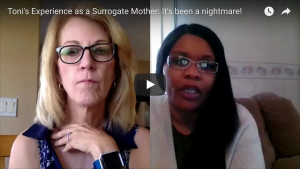 Many of these women want to share their stories so that those considering being a surrogate mother (or using a woman as a surrogate mother) can have a full picture of the realities of surrogacy. This was exactly the case with Toni, who first reached out about this time last year. Jennifer Lahl, the CBC’s President, interviewed Toni via Skype, asking her to discuss her experience, why she reached out, and what she want others to know about the practice of surrogacy. They spoke for about 20 minutes, and it’s a window on how terribly wrong surrogacy can go. Please have a watch and then let us know what you think of the interview and of this interview format. And, of course, please share this on your networks. Thanks!